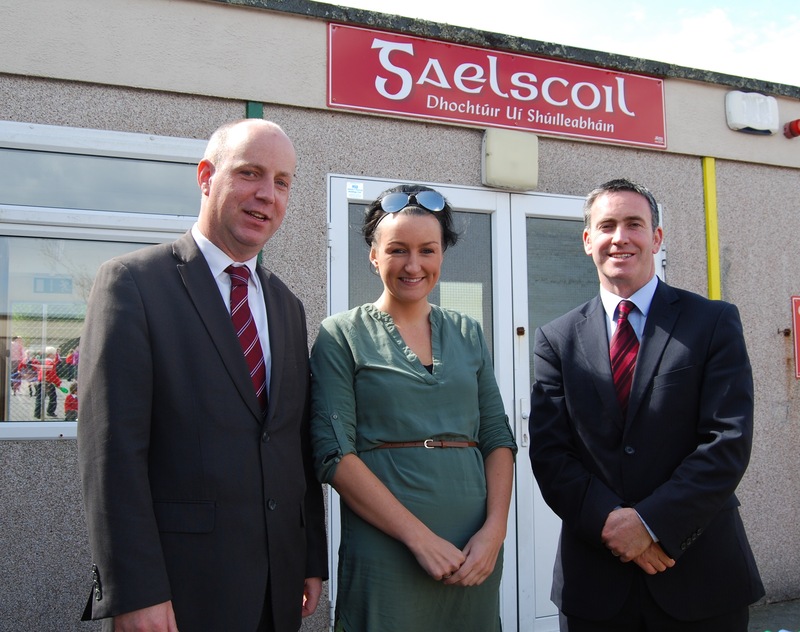 There was good news for Skibbereen town when Minister of State at the Department of Education Damien English TD confirmed a new school building for the staff and students on a visit to Gaelscoil Dr. Uí Shúilleabháin last week. The school which is 21 years old has been looking for a permanent building for many years and has been accommodated in temporary pre fab structures for almost all of its existence. The Minister was accompanied by local Fine Gael TD Jim Daly who was a former principal teacher at the school prior to his election as a TD for West Cork. The site for Gaelscoil Dr. Uí Shúilleabháin’s new build is on the site of Rossa College and is currently being transferred from the Cork ETB to the Department of Education. Minister English confirmed on Thursday of last week that the Department of Education has agreed to the building of a four class room new school building with appropriate ancillary accommodation which will include a General Purpose room, Library and Resource area, multi purpose room and office space. The new development will make provision for up to 70% expansion in the current enrolment. Speaking in Skibbereen Minister Damien English advised the School management that when the school signs up for the new proposals, his Department will begin the next steps to secure planning and proceed to tender and then construction. 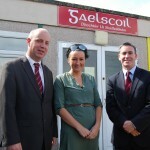 “I was delighted to travel to West Cork to visit the Gaeilscoil in Skibbereen with Deputy Jim Daly. My Department has approved this worthy & much needed new school building in principle. The necessary resources and funding will be made available to bring the project from design, to planning and through to the construction stage. Having viewed the current accommodation at the school, I look forward to the early progression of this project and will ensure every assistance is made available during this process.” stated Minister English. Deputy Jim Daly expressed his delight at what he described as “very long overdue but none the less welcome good news” for parents, students and staff of the Gaelscoil in Skibbereen. “I tried to progress this project as Principal Teacher over a decade ago when money was plentiful and development taking place at every cross roads but to no avail. I am so happy for the school community to see this dream finally become a reality. Investment in our young people and their education system will reap multiple dividends for generations to come.” commented Jim Daly. Jim Daly TD who is vice chairman of the Oireachtas Education Committee also confirmed that he discussed with Minister English the next priority for Skibbereen which he believes should be to develop the potential offered by the amalgamation of the 3 secondary schools to establish a full time 3rd level campus on the site of the former Rossa College.